How do you feel about fall flavours? Apples and cinnamon and pumpkin pie. Crunching through autumn leaves with a warm cider or cozying up with soups and casseroles. Honestly, I am not that crazy for it. I spend most of autumn mourning the end of summer and mentally preparing myself for winter. But I can’t deny the allure of a cinnamon-spiced apple crumble or a homemade pumpkin pie. Come on: pumpkin pie? King of pies! And this past Thanksgiving I made 3 fall beverages: an autumn sangria, a chilled ginger beer cider, and a cider punch. gently mix or shake the pitcher a bit to combine the fruits with the spices, sugar, and juice; then pour a bottle of red wine over top. Cover with plastic wrap (unless you have a pitcher with a top) and put it into the fridge. The wine: use whatever red wine you like, ideally one that’s not overly rich on its own – you want the flavours of the fruits and spices to come through. I used a cabernet, but really, that’s just what was on hand. When you’re ready to serve the sangria add a bottle of fizzy water, or, if your pitcher won’t hold it, pour the sangria into the serving glasses and top each with almost equal parts water and wine – a little heavier on the wine if you prefer, or more water to make it lighter. Make sure to include some of the fruit pieces in each glass. You could also use pears… I feel like autumn is all about apple love, but lets not forget pears. I also made a quick apple cider and mixed that with ginger beer and finished the jar (I have a tall 2L mason jar) with the cinnamon sticks from the cider, apple slices and pomegranate seeds. This was a big hit! I know it sounds like 2 ingredients, and I guess, ultimately, it is, but the spice of ginger beer and the cinnamon-apple cider combine to taste surprisingly fantastic. Plus it’s icy cold, with slices of apple tucked in and pink pomegranate seeds floating about. Definitely worth a try. Lastly, a cider with no fizz and no alcohol… for kids, really. Just the cider I made in the morning with some thinly sliced apple, and pomegranate seeds to be fancy. Ok, so what else about these fall favourites? It’s soup season. And (some of) my family really likes squash soup. So that’s eeking back into rotation. Sometimes I roast the carrot and squash first so it browns and gets extra delicious, but often I just toss them chopped and raw into the hot pot with the onion and carry on cooking stovetop. I love that I can make a pot of squash soup quite quickly that way. The same goes for hot cereal: oatmeal topped with granola. (Eeking back in, I mean.) If you haven’t tried this before you need to taste the crunchy sweet granola on each spoonful of warm oatmeal. 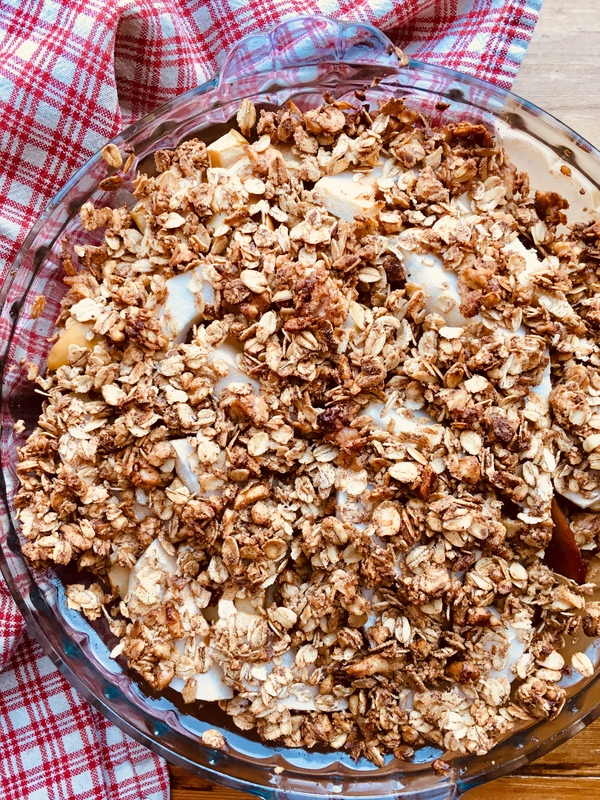 You won’t want it plain again; I think oatmeal really needs the granola topping. And what about pumpkin loaf and apple pie? Cinnamon tea and spiced lattes… do you go in for all these seasonal flavours? What are your fall favourites? For someone who says she isn’t crazy for Fall. You certainly have a lot of great Fall recipe ideas! Probably because I love working out what to do with food, seasonal or otherwise so I can’t help it!